- Wandsworth Common - do you love fishing? Time to grab your gear and head to the lake in Wandsworth Common to prove your fisherman skills. With the appropriate permit, you can do this activity here without any problem. You can also bring your children to the Scope educational centre. Also feel free to join any of the local groups of runners, cyclists and dog walkers on many of the trails. - Battersea Park - Battersea Park is a place where people can always find something to do. There is a site for exhibitions and travelling fairs, which often occupied and there is also a bandstand for groups to perform. From weird Guinness Clock monument to the children’s zoo and all-weather sport facilities for the exercise enthusiasts - there’s literally a feature here for everyone. - Tooting Commons - despite that fact that Totting Bec Common and Totting Graveney Common were separated in the past by building of railways and roads, they still feel like one big open space. Two notable features are present within the commons: Totting Bec Lido, a swimming pool open to public from May to September, and Tooting Bec Stadium within the boundaries of Tooting Graveney. - Wandsworth Park - smaller in size, but spacious enough thanks to the huge open field in the centre. Wandsworth Park features ornamental design worthy of your interest in its south east corner, and a beautiful avenue of trees along the river. 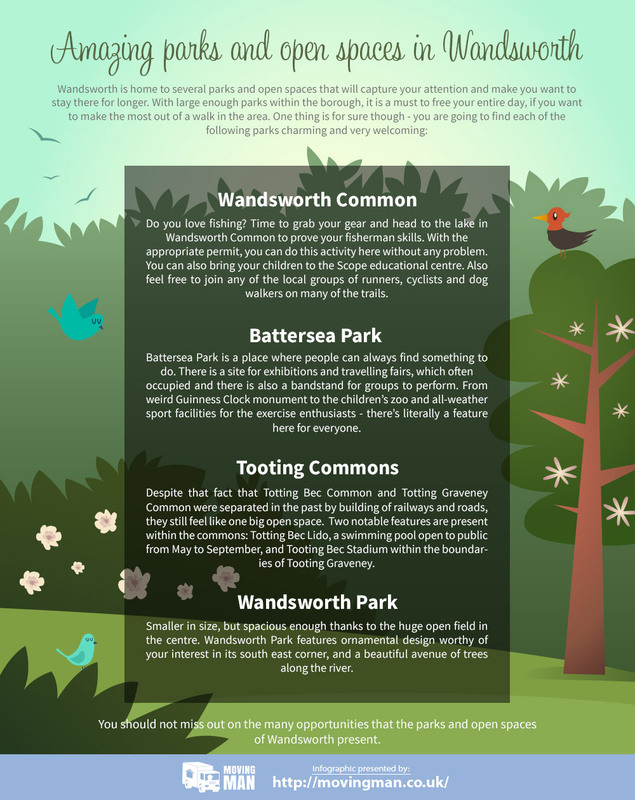 You should not miss out on the many opportunities that the parks and open spaces of Wandsworth present.